This entry is cross-posted from my primary blog. Here’s a non-exhaustive listing of places that have new hi-res satellite photos courtesy of DigitalGlobe: Aparri, Cagayan; Tuguegarao City, Cagayan; Infanta, Quezon; Naga City, Camarines Sur; Masbate City, Masbate; Iloilo City, Iloilo; most of Guimaras; Dumaguete City, Negros Oriental; Surigao City, Surigao del Norte; Lake Sebu, South Cotabato; Sarangani Islands, Davao del Sur; Culion, Palawan; and parts of Romblon. Shown above is Silliman University in Dumaguete. 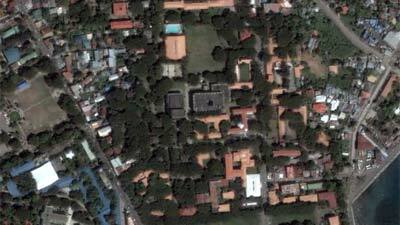 With Google Earth satellite photos it is very easy to trace locations. Hello. this is a nice map site. tnx Google Earth. I wish to be recipient of your program.